‘The Green Machine’ Mike Orlando continues to showcase his talent in the ring after a successful NCAA college football career. With a persona that originated in his football roots, Orlando has evolved into a premier performer both in the ring and on the mic. One of the most notable skills that Orlando has continued to demonstrate is his adaptability. And whether it is competing in front of a raucous crowd or a more intimate audience, he strives to give those he is performing for exactly what they want. With an array of technical moves and the ability to showcase high-flying maneuvers, Orlando aspires to personal greatness before anything else. Standing 6’5 and weighing 275 lbs, Orlando has been encouraged to remain a solid technical wrestler, but that doesn’t mean he won’t resort to pushing his body and skill set in a new direction. Orlando demonstrates a willingness to never rest on his laurels and a desire to make himself the best. As a current trainee of the Monster Factory, Orlando is surrounded by such notable names as head coach and trainer Danny Cage. Orlando’s dedication to his craft says a lot about him, but major promotions may want to have him as part of their roster. Tell us a little about the evolution of Mike Orlando. Where did the character originate from? And how it has evolved? When I first started I was a bodyguard in Old Time Wrestling, and that was where I was called the Smasher Mike Orlando, which was handed to me. It was pretty funny. It was for about a year and a half, and that was where I learned the ropes and whatnot. Then, I evolved into the Elite Athlete, which was more for me, and brought in my college persona, college football background. I was a football player, so I took everything from the football field and made it a wrestling type thing. Over time I just kind of outgrew football in real life. I don’t like football actually, I never enjoyed it all, and I wanted to kind of drift away from that. I was more of a workhorse, and I kind of incorporated with that the fact that I played football. So, I still incorporate that with the whole green machine gimmick, which is a true reflection of myself as a person, and as a character as well. It’s been a long ride, and it’s been a learning experience, to say the least. What have you had to learn the most? To just get out there and learn the ropes from everybody, rather than just stay in one place. If I stay over here, then I’ll dominate, and someone will care. That is good for a little while, but it’s good to just branch out. I wish I had learned that earlier, but at the same time, I am glad I didn’t. I would have been able to compete at a high-level with other people rather than just mess up, but it isn’t that I would change it I just wish I was more informed if that makes sense. Instead of worrying about all the stupid crap in the beginning, just think about the big picture. When you start wrestling you are thinking, what is my entrance going be to be like? None of that matters. It is what works, what doesn’t work, what do these people want to see? Then, when you get an idea of what everyone wants and then you can put it together and make one big character that everybody wants. It’s a learning process, but it’s not that I would have changed it, but more that I wish I had paid more attention to the grind in the beginning so it didn’t slow me down. Tell us a little about your early training and who can you say helped you with what? The first time I ever stepped into a ring was with Jim Molinaro’s Old Time Gym down in south Jersey. He was an ECW official back in the day, and an awesome guy. He taught me a lot; he was a head trainer at the time and may still be now, Brian Johnston, he is still a worker now, he was my age, maybe a little older, I learned a lot from him too. It’s odd to say he kinda ‘trained me,’ because it was in a gym. He definitely helped a lot. I was trained by John Trotsky of Sanctuary Studios, which he has had for a while. I worked under John for two and a half years, and I worked on a lot of theatrics, and background for a character. I worked on a lot more than just wrestling with him. The Monster Factory has been my home for the last two years. It’s been helping me get ready for the next step, the next level, and I hope for a WWE tryout. I continue to train with Monster Factory. That is my current training, along with continuing to be a full-time trainee with Ring of Honor’s dojo. It is a blessing to be there as well. Over your young career, you have competed for a number of promotions. What did you take away from those experiences and which did you find still help you today? It is kind of like, year to year and moment to moment. It is year to year, in order to reflect and don’t just judge yourself, and you are like, man, I kill it every match, I am this, I am that. When you watch yourself and say, wow, I really sucked there and I didn’t do this very well that is more year to year. As far as learning, it’s like anything else. Remember when your Mom would say don’t touch the stove it’s hot, it’s hot, it’s hot? Then all of a sudden you go ahead and touch it and say ‘ouch,’ you burned yourself because it was hot. It wasn’t hot because your Mom said it was hot. But you touched it, and not because you didn’t believe your Mom. It’s like that with wrestling; you go out there and you think you know everything and you meet these guys in better positions and they kind of give you advice and you act, ‘Oh, what does he know?’ That’s not what I want to do. You have your input and you try to act a certain way, and then you go out there and something completely blows up in your face. Or you think you are going to be the babyface and you try to react and everyone boos the sh** out of you, and now you are the heel and you have to react out there. It is kind of like a learning process, and going through the motions, and trying to go through it. Stop thinking, and you have arrived. You haven’t arrived until you are AJ Styles or one of these people that have a contract there, or contracts all over the world. But you haven’t arrived until it is time to reflect week to week. So, going from promotion to promotion, it is kind of like a cultural background. When I came to Canada, the respect of the people for wrestling was very different from, say, in New Jersey, and I am not putting any names out there and I am not shooting on any crowds, but if you compete in CZW in New Jersey and you aren’t killing each other, they will boo you out of the building. Now I am in Canada, and I hit with this, this, this, this, this and they are like ‘What? What in the world? Why? Why are you doing all that?’ So let me sit for a second think. This is the type of crowd that like headlocks, so okay, maybe I don’t have to hit 55 kicks in a row before my German suplex. You learn, and then when you go back to New Jersey and you try to rock a headlock for 35-40 seconds, those people are going to boo and chant boring and you will never get booked again. You learn the cultural background of what people want, and you learn to work with anybody, you learn everyone’s style. Are you wrestling Grado, and is he going to want to be more gimmick with you? Or are you wrestling JT Dunn and you need to have one of the best matches in the world with him, and do you adapt what are you going to do at that moment? So, I have learned from year to year more from failing, if that makes sense. The belts are great, they’re amazing, they mean so much. At the same time, it’s the person that has to make the belt. I feel if I didn’t have credibility then it wouldn’t have made the belts mean what they do. At the same time, I think they add credibility to me because I am trying to make those belts more legitimate. I am proud to have them. But I promote them as well. I put out videos with them and I do it all on my own. I edit them on my own, I put them together though I get people to aid with some things. I get help to edit all the theatrics and all that stupid stuff into it. I don’t see every independent wrestler doing that, and I kind of take on the role of if this person isn’t going to make this a big championship and I am not going to let them just sit there and hurt it. I’ll make it something big. That is why I take Championships seriously, and depending on the place I try to make sure that no matter what, my stuff will always be legitimate. It is kind of a pressure thing where, if I am the representative of a company, I need to make it look good. I am going to do everything I can make sure that it looks good. Which matches have you stepped in where the championships have looked good, but that you have looked good as well? The buildup to the BCW championship was, for sure. We definitely had a lot of stuff going on. I had wrestled Shelton Benjamin when I believe it was his only independent booking before being signed by WWE, and I wrestled Billy Gunn out there for a buildup. We had Will Ferrara of Ring of Honor come in, and we had a lot of people come in and challenge me and come in for an opportunity to be a champion. I feel that build up made that championship mean so much more. I think that my BCW reign has been my favorite as well in my career. I think that is where I am being a person that I have never been able to be, and that is myself. I am given free rein to just go there and get a reaction myself, and see what happens. And I do. A way to learn is to go out there with no expectations of what they want, just what I want, and it’s working. It’s working! The audiences are increasing, the matches are increasing. It is a good feeling and makes it feel more legitimate. I am seeing faces that I have seen all over the world, and they are saying ‘Oh let me come to BCW’ or ‘Let me come to meet you.’ It’s a cool thing. So, I am able to go back and forth with Ryback and was able to compete against Jerry Lawler for the championship. Those are, like, dream matches for me. The kid inside me is going nuts that this is what I do. The PPW championship has given me the chance to step up and not shut up. I am able to talk the talk and I am able to walk the walk. A promotion near to where I am, Lucha T.O, has seen the Green Machine in action. How did the opportunity to defend your championships come about, and were there ever plans for defending it over the border? It was a long-term booking. I had been booked to go there, and the night before we had a match in the lead up to the BCW championship, and things just got a little out of control, to say the least. Not to sit here and say the guy shot on me, but some things got out of control a little bit. My knees were taken out pretty hard, and I had to finish the match on one leg during the tournament. Once they told the story to my friends, it got back to the promoter and they said ‘Oh you won the championship out there, are you alright?’ I said, ‘Oh yeah I am trying to make this company look better, is there a way where I can defend this championship and have a little more honor than what happened last night?’ I was crowned the first-ever champion there, and there was supposed to be a ceremony. I just want to make it up to them and give them their deserving ceremony, and the promoter really understood and took me up on that, and let me defend it there. It was a great match and there are some really talented people out there. What would you say are the matches you are most proud of and why are you so proud of them? I have a split decision on this, actually. The first one, it was kind of a spur of the moment thing. Sami Callahan had just gotten released from NXT, so we are talking two and a half years ago. He was doing a seminar for Fighting Spirit Wrestling in Queens, New York, and I went to the seminar, was not booked on the show, and I am not saying I was a standout, but all of a sudden, the promoter came over to me and said ‘We are going to book you against Sami for the show.’ I wrestled Sami in a tag-team match, and I was very basic at the time. It wasn’t that I couldn’t do what everyone else was doing, but I was very basic in the sense that I try to keep it simple and always look good. Sami came back and he was very hungry to be back on the independent level after leaving NXT. So, he said, we are going to do this, this, this, this, this, this and I was like oh my God, I don’t know what to do right now. How do I tell this guy I don’t know how to do any of this? In the end, he said ‘Hey, big man what’s your best high-flying move?’ I always like to high-fly, but I was always told by my old trainers to stay on your feet. I told him, ‘Yeah, I can do a moon sault.’ He said, ‘Nah, you’re doing a corkscrew over the top to the outside,’ and I kid you not man, I look to the outside and I am like, are you crazy? What do you mean a corkscrew? He said, oh, you just go like this and you do this and you do that, and he’s showing me with his body in the back of how you do a corkscrew. I am like, I have never done that and he’s like well, you are doing it today. So, I was like, oh, okay I am. Like, it is Sami Callahan, and I got put in this match as an addition. I should be happy and I am just going to go out there and go with it. We went out there and every single thing worked so well, and that crowd was so into it. It was so hot. I had gotten reactions before. For example, I had power bombed somebody and everybody oohs and ahhs, and everyone gets that reaction. I never heard anybody on their feet the whole time like that was. I remember going to this corkscrew, almost hesitated, but I didn’t and it was the craziest thing I had done in my career. Everyone popped and it was awesome, and everyone went for the finishes and everyone was happy with it. We went to the back and he gave me his information. Here, I am just going to a seminar, and here I am at the end of my night talking with Sami Callahan and I am wrestling with him. That is something that really stands out in my career. It was one of those Oh My God moments for me. 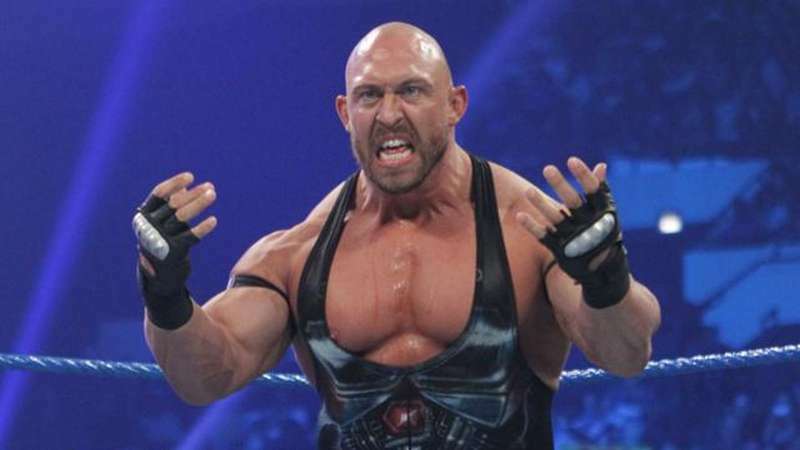 Another time was when I faced Ryback. I showed up, coming from a convention right before, and I was almost late for the start of the card, but I wasn’t late for our match. But it was later than he had gotten there. He basically called this match where he wanted to do all this stuff, and do stuff that you would never see Ryback do in the ring, and it was awesome and he was so excited to wrestle and do all these things. I had no idea he could suicide dive, he could tope to the outside, and I didn’t know he was going to do all this stuff. I didn’t know this guy was going to come to work like this. So, we go out there and this place was packed and I couldn’t believe it. The crowd was so into everything we did, and then he fakes an injury at one point of the match and called an audible because he said he tore his hamstring and we changed everything, and we did all this different stuff and then at the end of the match he’s like, ‘Nah I didn’t have an injury, I just wanted to fake out all the marks in the front row that think they knew everything and every spot. I wanted them to hear me say, oh my God, I’m hurt and make it look like things were wrong, so when I finally picked you up for the shellshock they felt I really had to struggle to get you up there because my hamstring was torn.’ I was holy crap, that’s great storytelling! When I say the whole place was on their feet, it’s ridiculous. So that would be my second moment. I learned a lot from that match and just how to work on the fly with the crowd. You’ve previously discussed going to the WWE Performance Centre. If there was anything you can take away from that experience what would it be? Would you have changed anything about your time there? The answer is in the question: The opportunity to bring me in at the right time is pretty much it. They have about 150 new talent. They have about another 100 people in NXT that they aren’t using already. I cannot blend in with anybody right now. I’d rather do what I am doing right now, and make the most impact in the world right now so that I can step into a role where they want me for me that they want me for whom I am and they need this product on our TV. I am still very close to that. But when you are hiring 150 new people, what’s another one? Why do we need another one right now, when we have 150 that we are going to go through? So, it is kinda keeping your head above water, staying relevant, making the most money possible so that you make as much money as you would for them. I have learned it’s a business, it’s one big business. It has nothing to do with sports. The NFL for me was just putting my hands in the dirt and knocking someone back. In WWE, Global Force, Ring of Honor, this is business, they need money. So unless you’re making money for them, they don’t need you. So, with 150 people costing them money right now, they are going to use what they have first before branding anything else. As long as I am doing what I am doing, then there is going to come a time when they say there is time to work, and then we’ll work a bit. We have talked about working with different talent. Recently, something pretty unfortunate took place in a match where the wrestling community seemed to join together, about how to trust must be maintained between workers. What is your take on these events and what that means? I think that is a cowardly way of handling things. I look at it as a business, and you are trusting someone with your life. Accidents will happen, do not get me wrong. Miscommunication happens, and that’s one thing. But to deliberately try to hurt someone is one of the lowest acts for anyone to do, and it makes you a coward. I say you handle it to someone’s face, and you handle it like a professional. Don’t handle it the way it was. We are supposed to be a brotherhood. Everybody should know the trust can’t be broken, and if it is broken you address it in the back. There should be nothing outside for the people to see, that’s just my opinion on that. It’s a sad situation because it just shouldn’t be, but it is. Is there anything you would like to promote, share, make fans aware of as it pertains to the Green Machine, Mike Orlando? Where can fans reach out to you if they want to connect with you and what you have happening? You can follow me on Instagram and Twitter. Instagram is my strong point, @thebigorlando. There’s Facebook.com/eliteorlando, and you can like my page and communicate with me through there. If you go to prowrestlingtees.com, seek the Elite Athlete and you can see all my t-shirts there and you can connect with me for any merchandise. Try to keep up with me online and follow where I am at in Canada, the U.S, hopefully in the UK soon. Those are the best ways to contact me, along with my YouTube Channel. Subscribe, and you can find any of my links through social media.